Time and time again I run into an issue that presents me with a SID which I need to resolve. I’ve used a number of tools and scripts over the years to address this issue. I think I have the best and easiest method for me to solve this issue that always seems to pop up. Now just save this file and you can run it to return the results of the SID that you place in there. The one thing that will change is the actual SID. In this example i’m using S-1-5-21-768745588-123456789-987654321-500 which is the Well Known SID for the domain Administrator. My results should show me the friendly name. Anytime you change the SID you will have to resave the file but then just Run the script and it will show you the results. I’m sure there is a way I could make this into an application but I”ll leave that fun for those looking to take this to the next step. I know, all AD admins have trust issues…not just literal ones but we also think about the trusts we have in our Active Directory environment. As you all know I”m a fan of quick easy ways to get info. Today’s tidbit is how to use nltest to verify your trusts. The following command and switches can be used to view all of your trusts. You can perform them from any system in your domain, just specify the DC in the command. Just replace the dc_name with your domain controllers name and it will list all of your trusts to the domain that the DC resides in. Another tidbit I like to do is filter it by name if you have multiple namespaces. Here you would replace name with the name of a domain or part of the namespace you are looking for. However if you are working in a trusted multi-domain environment the following command can help you view the FSMO role holders remotely. This is just a huge time saver and hopefully you can add it to your tool belt of commands. 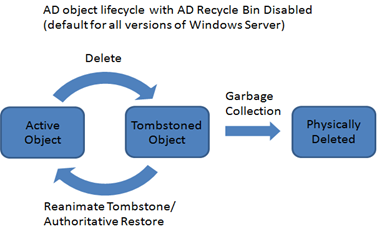 After writing my article on the AD Recycle Bin I thought I would include a few PowerShell scripts here that can be used to modify the tombstone lifetime along with the deleted object lifetime. Remember that the default for both of these is going to be 180 days and will show up as Null if you use LDP to view the attributes. Just saw that a good friend and former co-worker FINALLY has a blog up. Jason’s blog is geared toward PowerShell and it already has some nice posts as well as some videos on PowerShell. I’m so far behind on the PowerShell curve but i’m sure Jason’s blog will help get me up to speed. Also i’m going to need Jason to explain to me why his videos on Microsoft PowerShell are in .MOV format???? What is up with that??? ?